Bob Criss doesn’t claim to walk on water, but on a walk over the water, he has a lot to say about current [pun intended] issues. On a windy, June-morning stroll across historic Eads Bridge just north of downtown St. Louis, Criss offered a guided tour that combined science [he’s a hydrologist and professor at Washington University in St. Louis], history, a bit of math and a large dollop of politics. A walk across Eads Bridge is an experience that, it’s probably safe to say, most residents of and visitors to St. Louis routinely miss, even though the iconic structure—one of the first major bridges across the Mississippi—is just one street-crossing from the Arch. That’s unfortunate, because the view from the refurbished Eads Bridge pedestrian lane offers a perspective that you can’t get from the top of the Arch or from a car window at 50 mph. For example, ask someone how wide the Mississippi is at St. Louis, and the answer will probably be about a mile. That measurement, says Criss, was nearly correct in the mid-1800’s, when a young engineer named Robert E. Lee measured its width at 3500 to 4500 feet at St. Louis. Today, however, the river is significantly narrower, and Criss challenged participants on our walking tour to calculate its width by counting their paces across the bridge. Using the “pace” method, or even a more high-tech calculation employing a global positioning device that Criss supplied, the width of the river turned out to be only 1800 feet. But Criss’ guided waterfront tour is not just a diatribe against the Army Corps of Engineers. He also offers intriguing historical lore that adds color to the story of the Mississippi River and its sojourn through St. Louis. 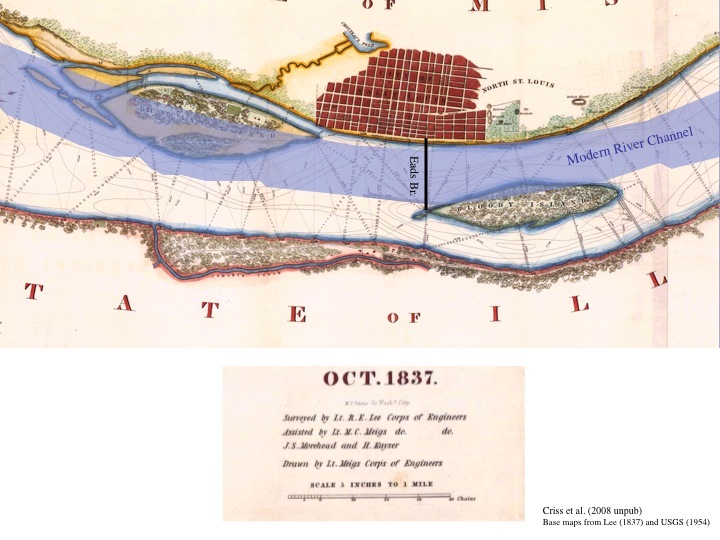 In 1811, powerful earthquakes, centered in New Madrid, Missouri, created a giant lake in Tennessee and caused the Mississippi River to flow backwards. It’s a story that Criss has heard many times, but can’t confirm, because not many people were living in St. Louis at the time, so the phenomenon was not well documented. Just to the north of Eads Bridge, there was once a land mass called “Bloody Island.” It got its name, in the early 1800s, because it was the location of choice for duels. 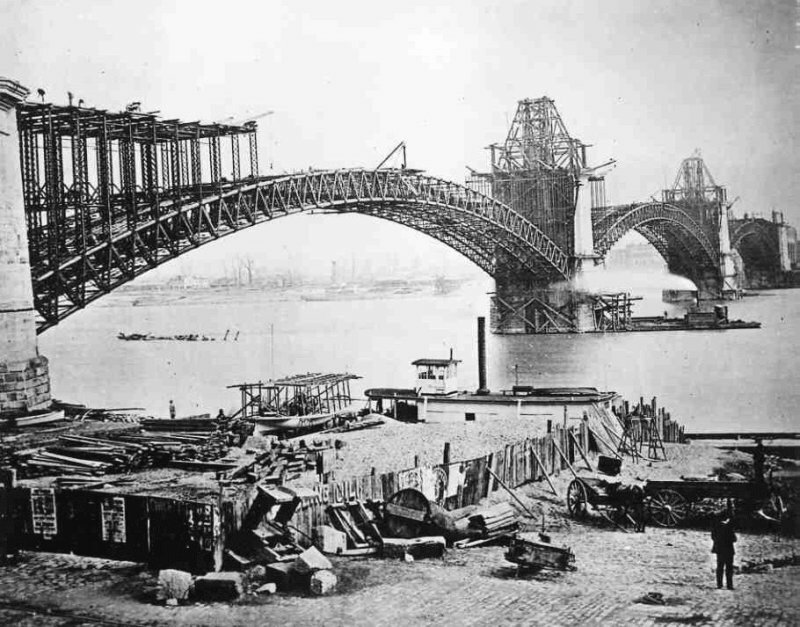 After the Eads Bridge was completed—it was considered an engineering marvel in 1875—the Corps of Engineers petitioned Congress for permission to blow it up. The intent, says Criss, was to keep railroads, which would cross the river on the Eads Bridge, from siphoning grain traffic from the barge industry. Standing at the east end of Eads Bridge, looking west at the Gateway Arch, Criss also speaks wistfully of lost opportunities to integrate St. Louis with what should be one of its greatest assets, the Mississippi River. At the east end of the bridge, an inclined walkway and a staircase lead to a rather unattractive MetroLink station, whose main purpose is to bring customers to and from a large gambling casino. At ground level, a floodwall completely blocks any view of the river. Criss’ wish is for better understanding and appreciation of the science of rivers, more attention to the river’s benefits for people and the environment, and less political influence over river maintenance and usage. His battle has been long and uphill. The good news is that he is not alone in his quest. Previous Post:Why does Haiti have it so bad?